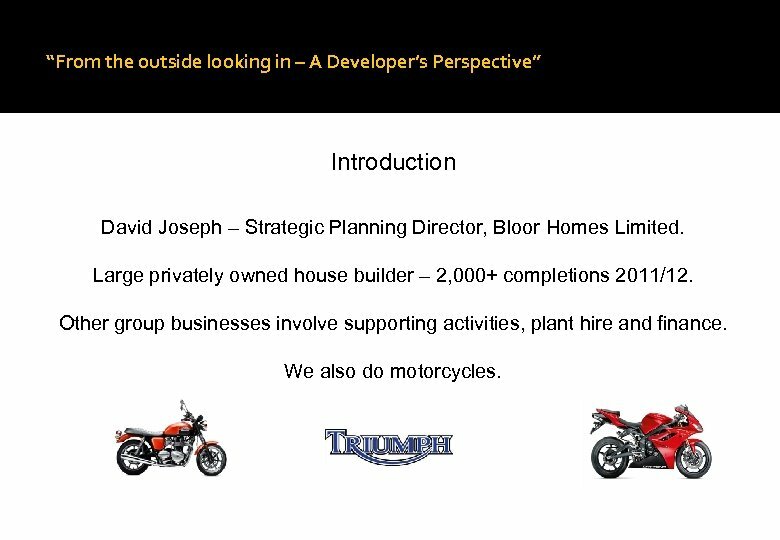 “From the outside looking in – A Developer’s Perspective” Introduction David Joseph – Strategic Planning Director, Bloor Homes Limited. Large privately owned house builder – 2, 000+ completions 2011/12. Other group businesses involve supporting activities, plant hire and finance. We also do motorcycles. 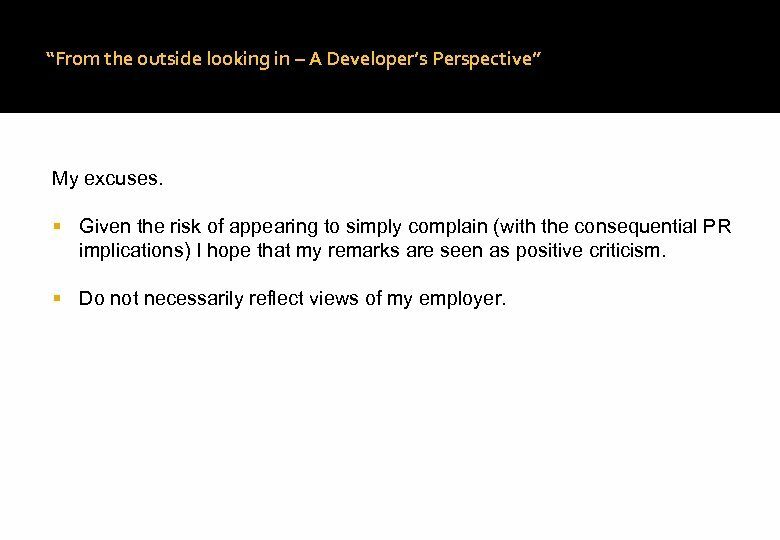 “From the outside looking in – A Developer’s Perspective” My excuses. Given the risk of appearing to simply complain (with the consequential PR implications) I hope that my remarks are seen as positive criticism. Do not necessarily reflect views of my employer. 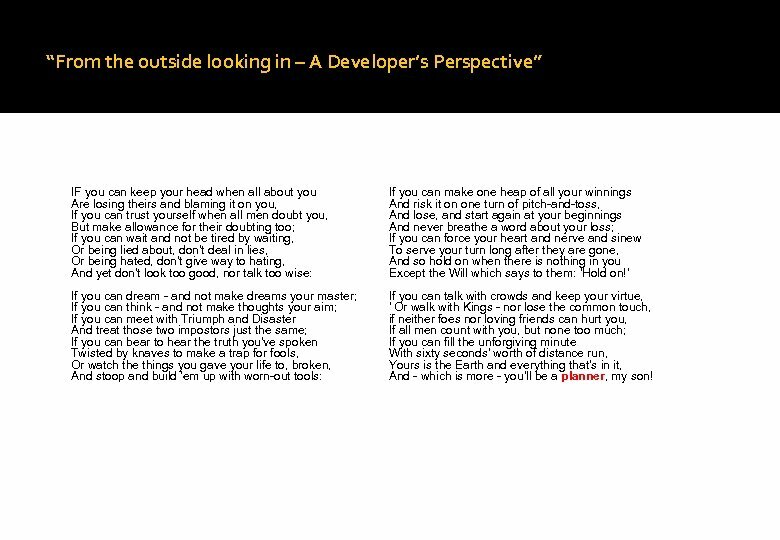 “From the outside looking in – A Developer’s Perspective” My approach. Choice of concentrating on either process or the professional’s role – chosen to look at the professional given the nature of the activities we’re involved in. Issues that arise are mainly a product of business pressures. 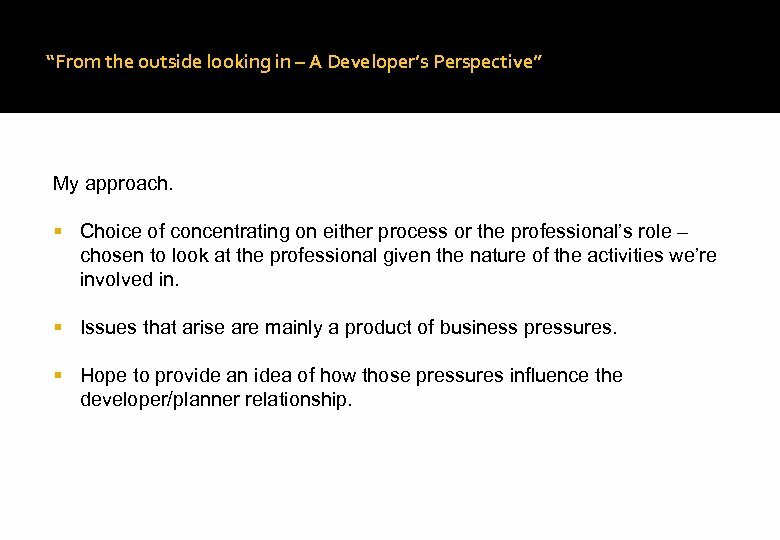 Hope to provide an idea of how those pressures influence the developer/planner relationship. 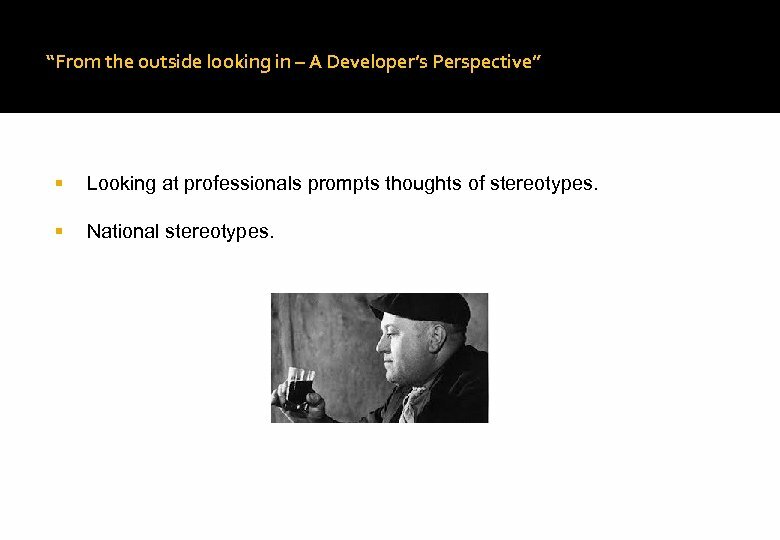 “From the outside looking in – A Developer’s Perspective” Looking at professionals prompts thoughts of stereotypes. National stereotypes. 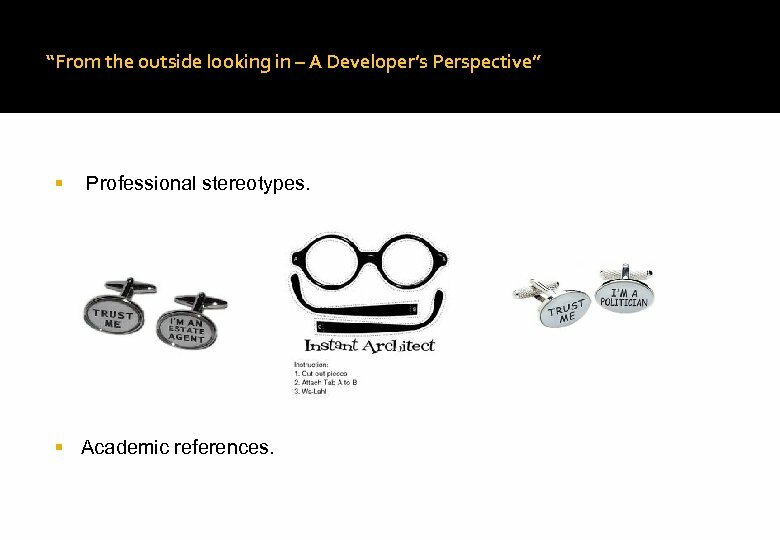 “From the outside looking in – A Developer’s Perspective” Professional stereotypes. Academic references. 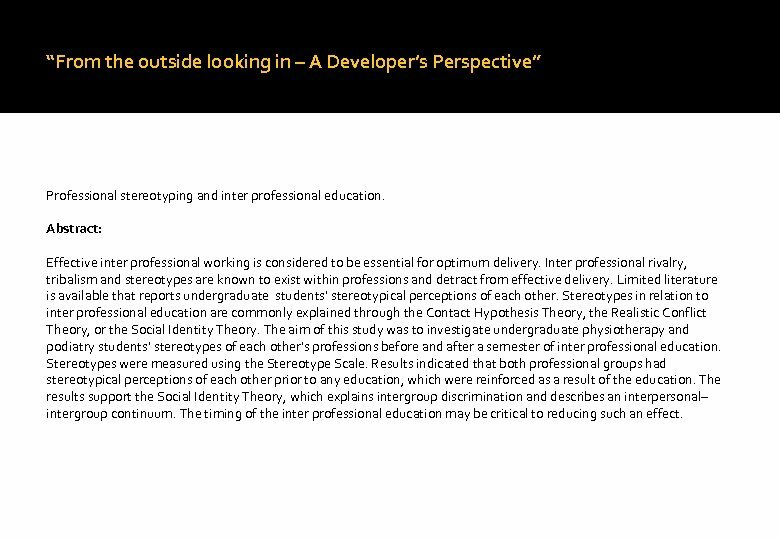 “From the outside looking in – A Developer’s Perspective” Professional stereotyping and inter professional education. Abstract: Effective inter professional working is considered to be essential for optimum delivery. Inter professional rivalry, tribalism and stereotypes are known to exist within professions and detract from effective delivery. Limited literature is available that reports undergraduate students’ stereotypical perceptions of each other. Stereotypes in relation to inter professional education are commonly explained through the Contact Hypothesis Theory, the Realistic Conflict Theory, or the Social Identity Theory. The aim of this study was to investigate undergraduate physiotherapy and podiatry students’ stereotypes of each other's professions before and after a semester of inter professional education. Stereotypes were measured using the Stereotype Scale. Results indicated that both professional groups had stereotypical perceptions of each other prior to any education, which were reinforced as a result of the education. The results support the Social Identity Theory, which explains intergroup discrimination and describes an interpersonal– intergroup continuum. The timing of the inter professional education may be critical to reducing such an effect. 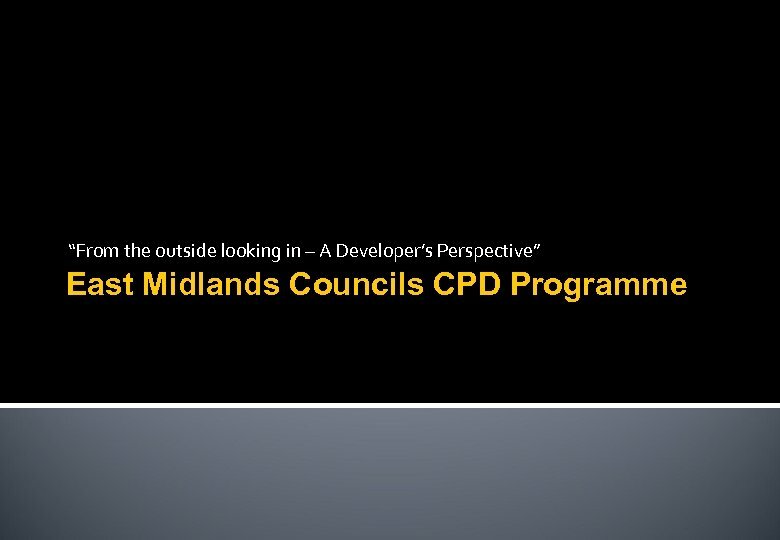 “From the outside looking in – A Developer’s Perspective” So what about planners? Question – who’s this? Overweight, dark suit, drives Jag! 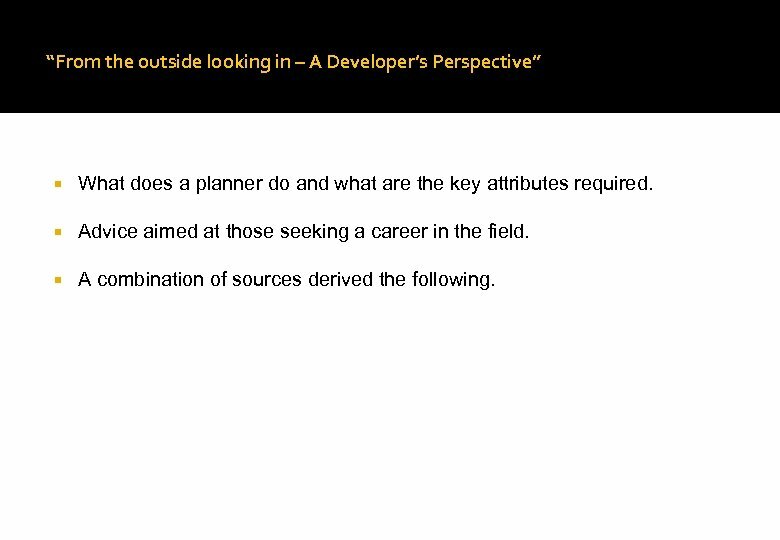 “From the outside looking in – A Developer’s Perspective” So far little to assist – looked at what skills & attributes the professional and education sector looks for. Heartfelt plea, those involved in undergraduate or on the job training – critically review the extent of the vocational aspects involved. 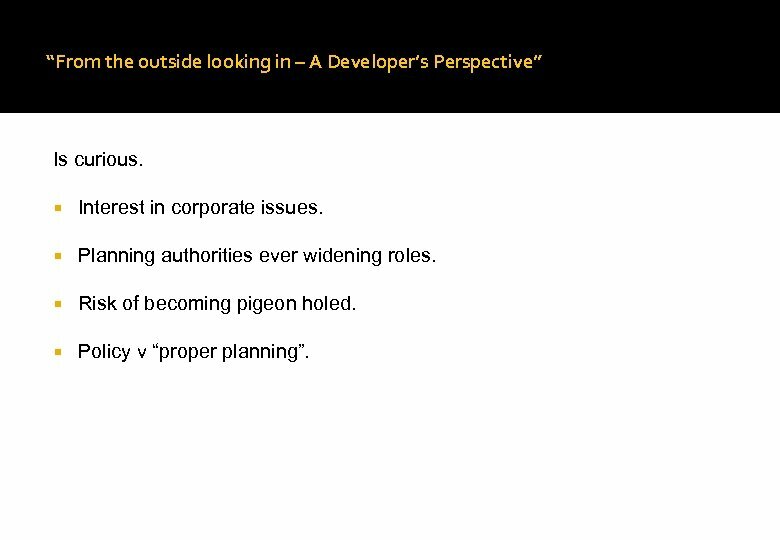 “From the outside looking in – A Developer’s Perspective” What does a planner do and what are the key attributes required. Advice aimed at those seeking a career in the field. A combination of sources derived the following. “From the outside looking in – A Developer’s Perspective” Interest in the issues, is curious, considers the feasibility of plans, consults with others, assesses proposals & monitors seeks integrated solutions, brings parties together/deals with tensions, has endurance & perseverance, outcomes, researches & designs policies, presents proposals and manages resources. 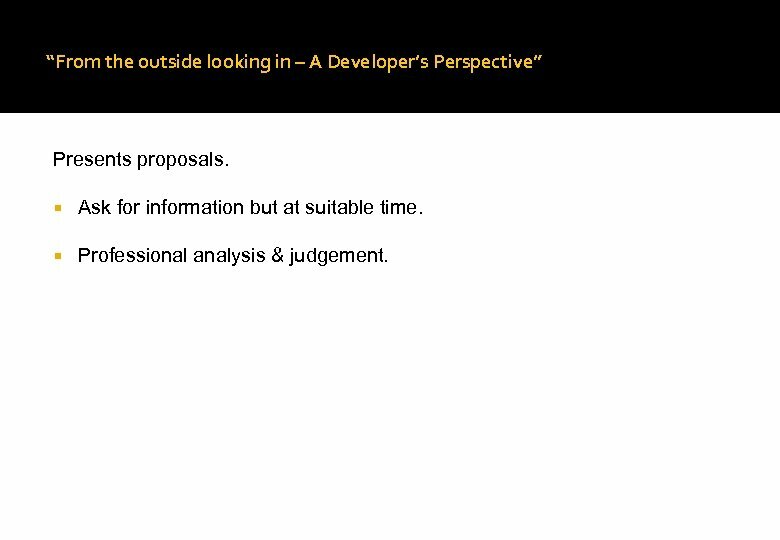 “From the outside looking in – A Developer’s Perspective” Interest in the issues. What appeals to you most? 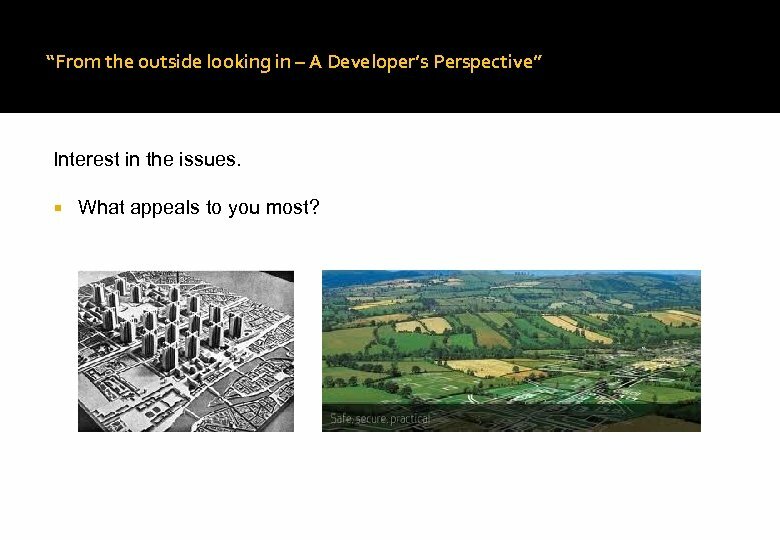 “From the outside looking in – A Developer’s Perspective” Feasibility of plans. Topical issues of viability and economic benefits. Perceptions of risks & rewards. Industry can be used as an economic governor/macro economic influences. Raw material is in democratic control. 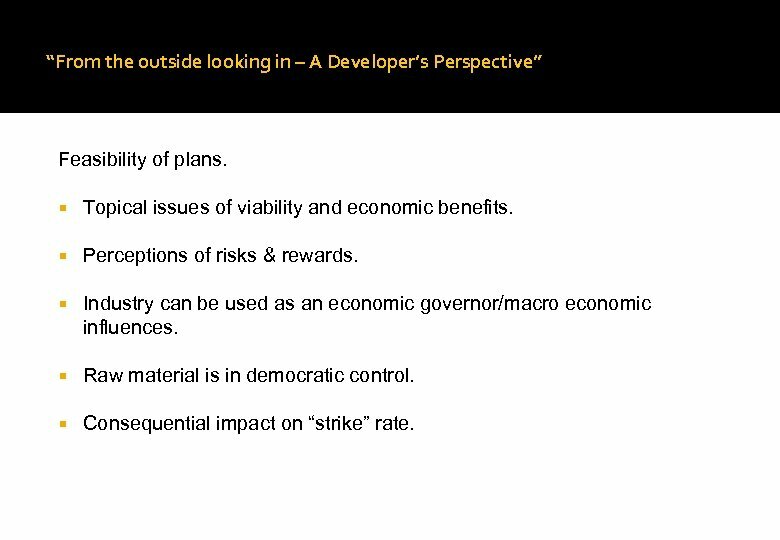 Consequential impact on “strike” rate. 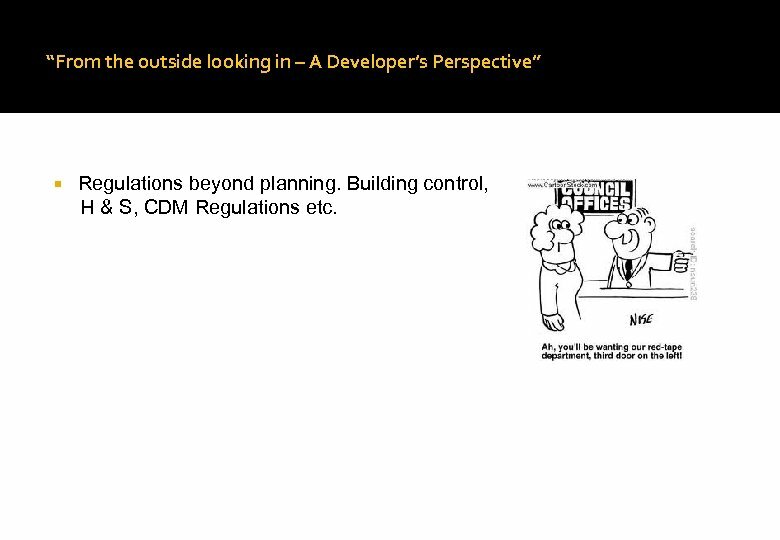 “From the outside looking in – A Developer’s Perspective” Regulations beyond planning. Building control, H & S, CDM Regulations etc. 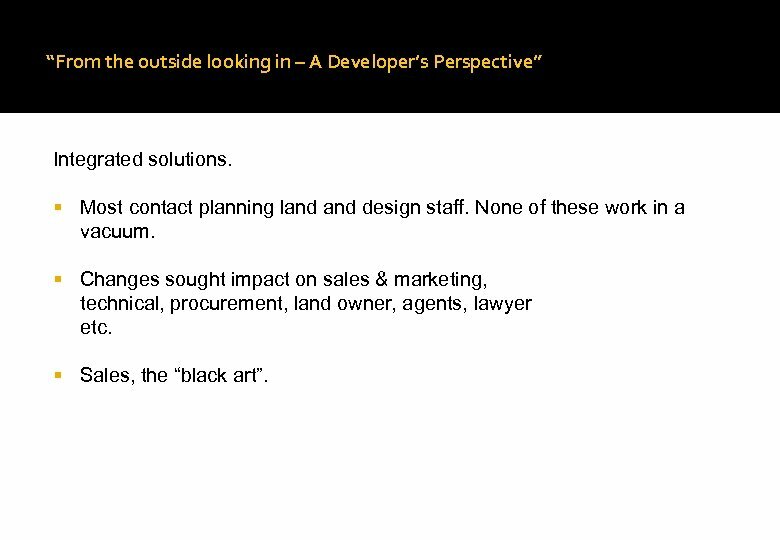 “From the outside looking in – A Developer’s Perspective” Integrated solutions. Most contact planning land design staff. None of these work in a vacuum. Changes sought impact on sales & marketing, technical, procurement, land owner, agents, lawyer etc. Sales, the “black art”. 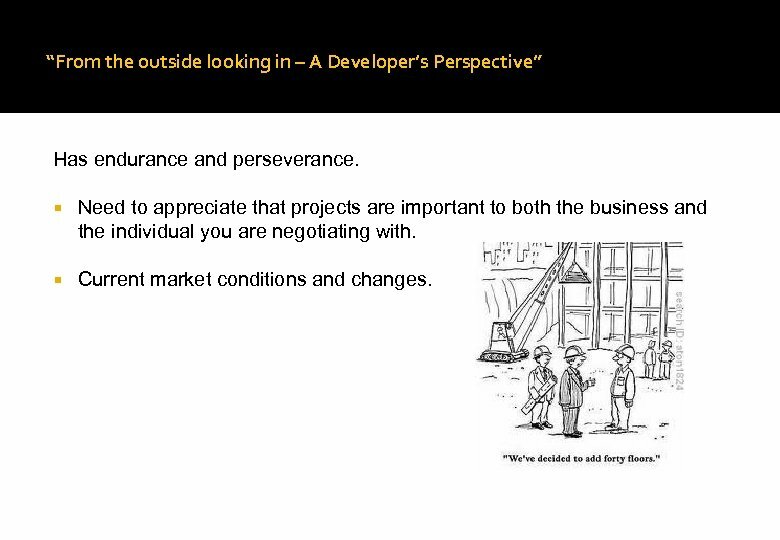 “From the outside looking in – A Developer’s Perspective” Has endurance and perseverance. Need to appreciate that projects are important to both the business and the individual you are negotiating with. Current market conditions and changes. 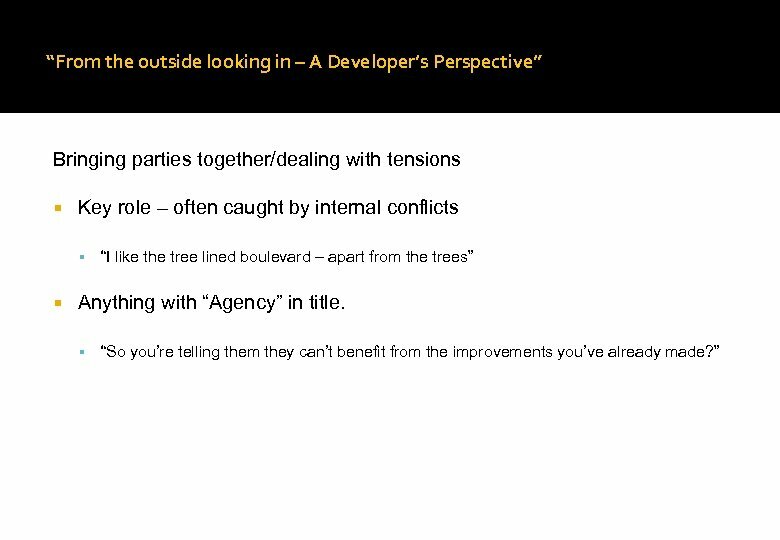 “From the outside looking in – A Developer’s Perspective” Is curious. 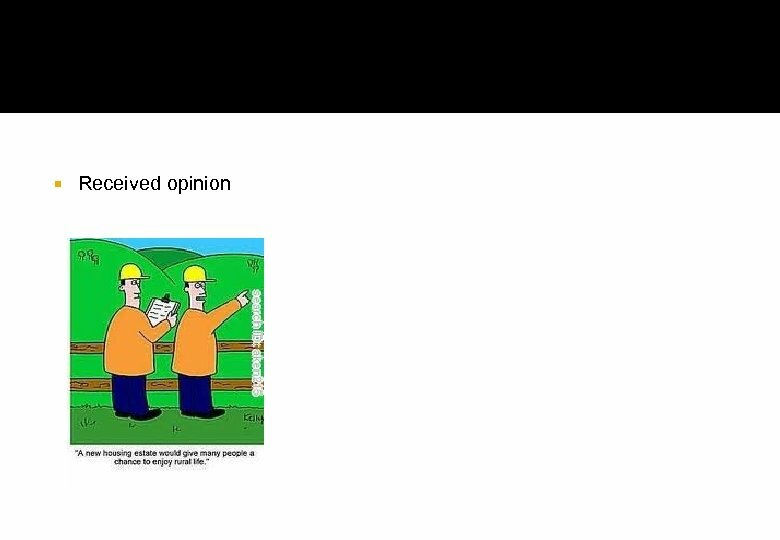 Interest in corporate issues. Planning authorities ever widening roles. Risk of becoming pigeon holed. Policy v “proper planning”. 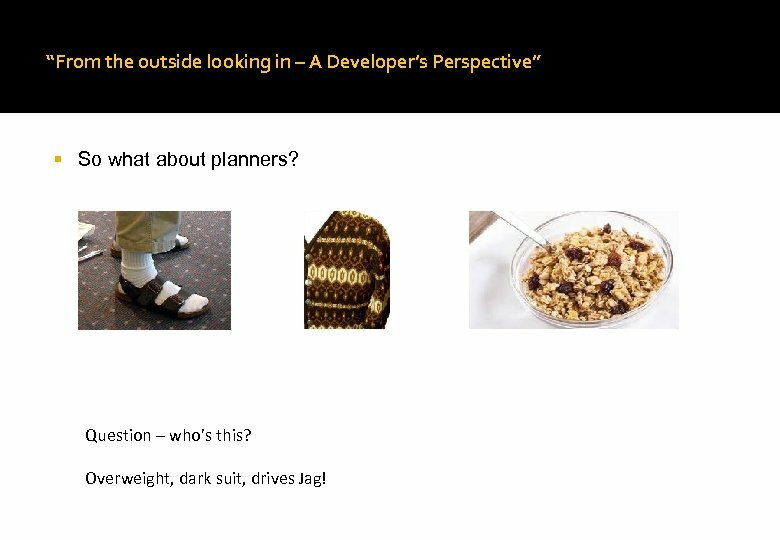 “From the outside looking in – A Developer’s Perspective” Consults with others. Two schools of thought. Consult forever until everyone is happy or consult and respond where appropriate. 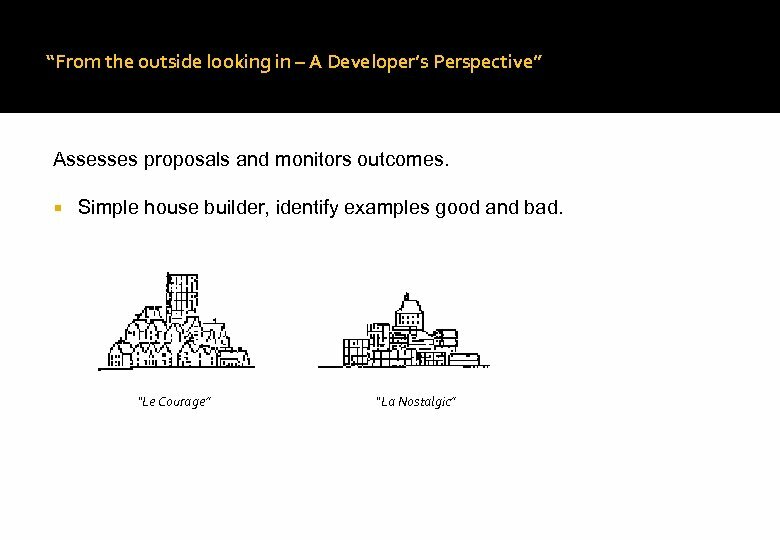 “From the outside looking in – A Developer’s Perspective” Researches & designs policies. “It's the policy, stupid”. Policy documents becoming longer. 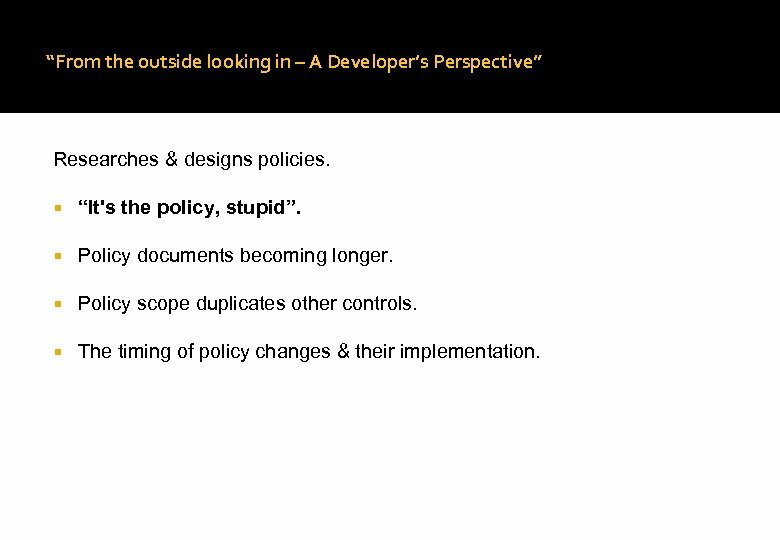 Policy scope duplicates other controls. The timing of policy changes & their implementation. 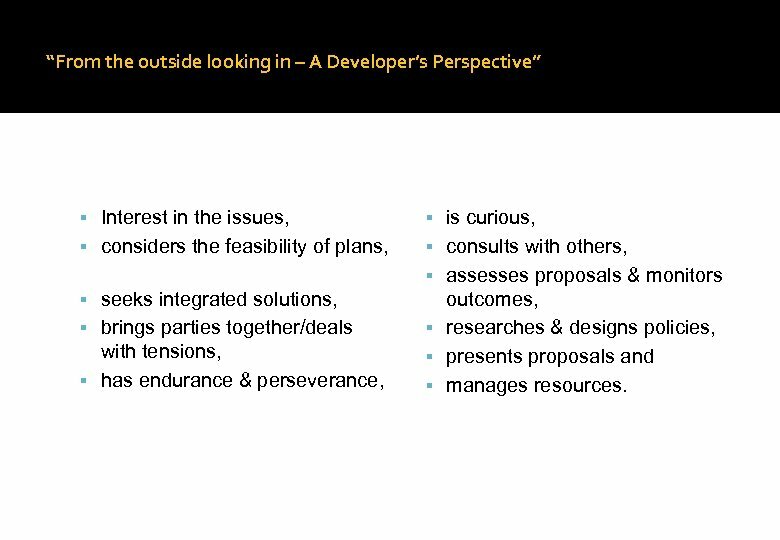 “From the outside looking in – A Developer’s Perspective” Presents proposals. Ask for information but at suitable time. Professional analysis & judgement. 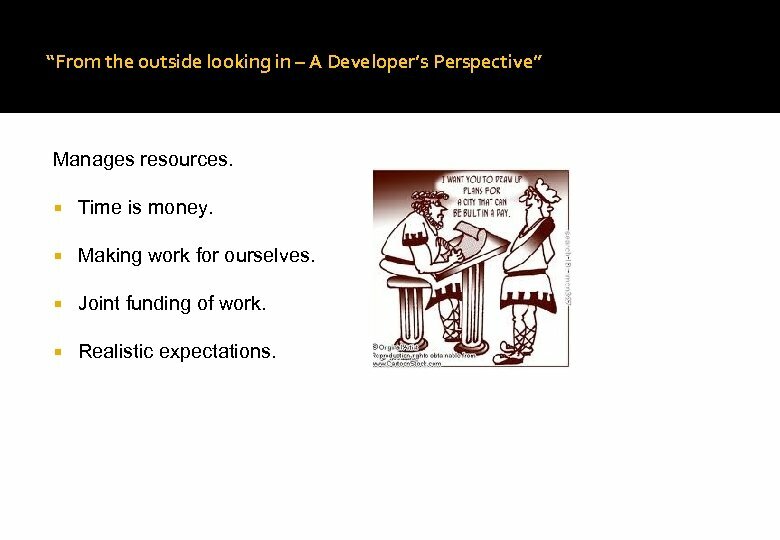 “From the outside looking in – A Developer’s Perspective” Manages resources. Time is money. Making work for ourselves. Joint funding of work. Realistic expectations. “From the outside looking in – A Developer’s Perspective” IF you can keep your head when all about you Are losing theirs and blaming it on you, If you can trust yourself when all men doubt you, But make allowance for their doubting too; If you can wait and not be tired by waiting, Or being lied about, don't deal in lies, Or being hated, don't give way to hating, And yet don't look too good, nor talk too wise: If you can make one heap of all your winnings And risk it on one turn of pitch-and-toss, And lose, and start again at your beginnings And never breathe a word about your loss; If you can force your heart and nerve and sinew To serve your turn long after they are gone, And so hold on when there is nothing in you Except the Will which says to them: 'Hold on!' If you can dream - and not make dreams your master; If you can think - and not make thoughts your aim; If you can meet with Triumph and Disaster And treat those two impostors just the same; If you can bear to hear the truth you've spoken Twisted by knaves to make a trap for fools, Or watch the things you gave your life to, broken, And stoop and build 'em up with worn-out tools: If you can talk with crowds and keep your virtue, ' Or walk with Kings - nor lose the common touch, if neither foes nor loving friends can hurt you, If all men count with you, but none too much; If you can fill the unforgiving minute With sixty seconds' worth of distance run, Yours is the Earth and everything that's in it, And - which is more - you'll be a planner, my son! 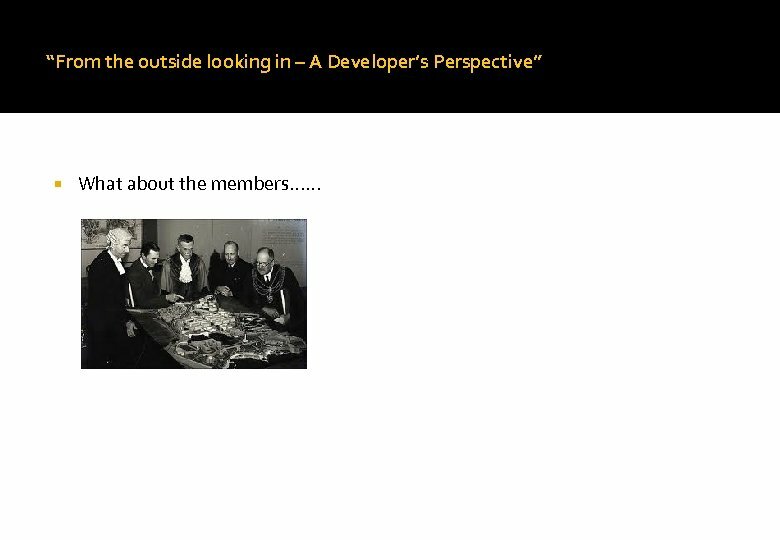 “From the outside looking in – A Developer’s Perspective” What about the members. . .